Okay, this is actually a fairly chill track and despite the fact that it has a flirty subtext, I’d listen to this while housing some French toast. 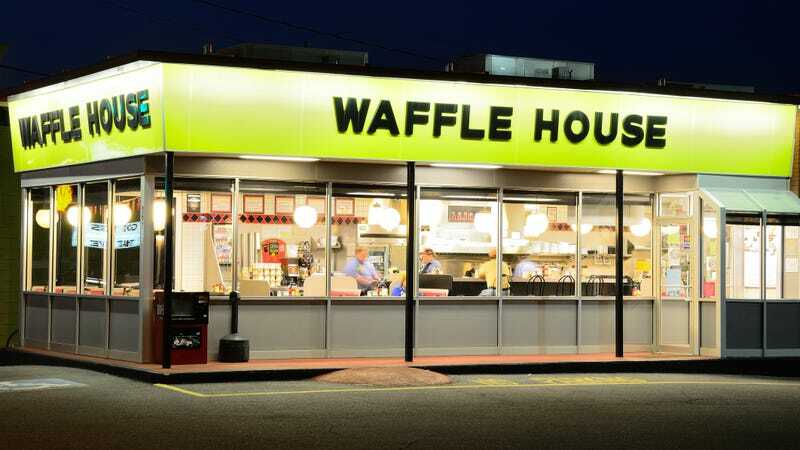 I swear I hear this song once ever 30 minutes on the radio, so I guess it makes sense that it would infiltrate Waffle House speakers as well. Call me a prude but I don’t really want to hear “Got hips like honey, so thick and so sweet” while I’m trying to enjoy my smothered hash browns. This song is everywhere and I can’t take it anymore. It even has an exclamation point in its title, ugh. This style of semi-contemplative country ballad is what I figure plays in the background of roadside diners where steely-eyed cowboys eat pie late at night, so I dig this choice. Bar mitzvah classic, and also apparently a Waffle House go-to. More Ed Sheeran, this time featuring the line “Will your mouth still remember the taste of my love?” No, because it’s full of pancakes. This is a weirdly soulful choice and I’m fine with it. It’s a song about uppers, which is naturally what I think of when I’m making the arduous bacon vs. sausage decision.